In May, Roger Clemens started talking again about his alleged innocence in taking illegal performance enhancing drugs. One of the ploys he tried is taking questions from readers of The Houstonist. The blog took the questions and performed an e-mail interview with The Rocket. I submitted a question, but I wasn't sure it would actually get sent to him. To my surprise, it was. First, I did not "let" Brian McNamee inject my wife. As I stated in the congressional deposition, I was not at home when the incident took place. All you have to do is read — just go to the congressional website and spend some time reading. I should have ended my question with "I want the TRUTH!" Of course, it takes more than one shot of HGH to get the desired results, so his answer was just thin enough to keep him out of jail for now. To be fair, though, I am impressed that he took questions from people (most of whom had fake names), without (supposedly) lawyers answering for him. Anyway, I got to ask a guy with over 4,600 strikeouts if he is a cheater, so that's another feather in my cap. 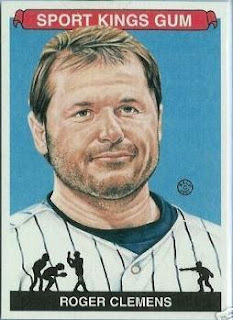 Awesome frumpy Clemens baseball card image courtesy of Wax Heaven. Tonight is the MLB draft. I don't know too much about this draft because no one watches college baseball unless their team is good. My alma mater's team is occasionally good, so I know a few of the guys that will be drafted. Of all the major sorts drafts, this one is the biggest crapshoot. Because there are so many players drafted and they more often than not spend time in the minor leagues, it usually takes a three to four years for these guys to even make a major league team. It's closer to college signing day than the NFL Draft. Hey, speaking of the draft, remember The Draft? It was the band that came about during Hot Water Music's hiatus. Their only full-length In a Million Pieces was pretty good. Check it. So, this is kind of weird. One, I'm posting two days in a row. Second, the YouTube video below. I stumbled across a link on MetsBlog that said a punk band covers "Meet the Mets." This is what it lead to. The girl awkwardly dancing(?) and the tired lead singer make it spicy. Ladies and gentlemen, please give a warm welcome to Seanchai and the Unity Squad. Also, I had a bunch of time on my hands and played around with the Xtranormal stuff. Sports journalism meets Samuel Beckett. So as I recently sought out a temporary substitute for Evan Longoria, who pulled a hammy, on my fantasy team, I picked up the Diamondback's Ryan Roberts. I had never heard of him, but he has been hot lately and he'll get more playing time because of an injury to Chad Tracy. After I added him, I noticed on his profile pic, he has a neck tat. Since I don't really have a way to find out punk fans in MLB, I have to use context clues. A neck tat is a good clue. So I researched. Wikipedia says Roberts has over 30 tattoos. There aren't too many other clues out there so here's a couple pics of his ink. If anyone watches D-Back games regularly, listen for his at-bat song. Maybe he plays some Clash or something. Tangentially related, the bassist for the band The Briggs is named Ryan Roberts as well. Let's be clear, they aren't the same guy, but it's one way to get some music in this post. Photos from Matthew Stockman/Getty and Elaine Thompson/AP.